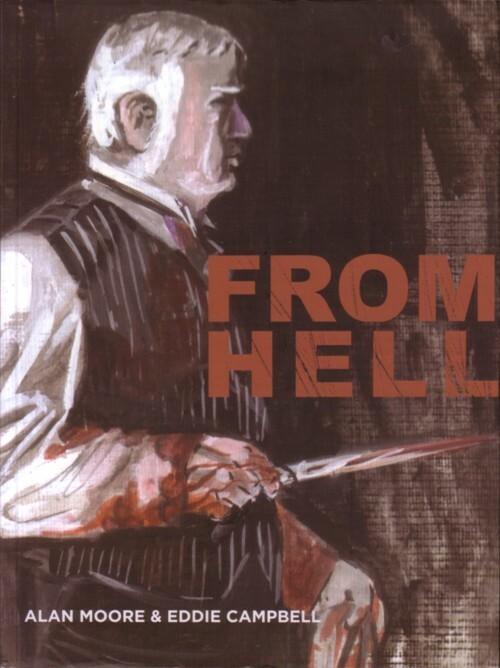 If things work out as planned I will do the lettering of the Dutch edition of the comic book ”From Hell” , written by Alan Moore and drawn by Eddie Campbell. The cover for the Dutch edition is none of my business, but having nothing better to do I noticed that the spacing of the title bothered me. The word “from” is not equal as wide as the “hell” in the typeface used here. For some reason I am never asked to make book titles for comic books (or any other books). That makes me the wrong person to say that I find many comic book titles unattractive, because the typeface doesn’t fit the drawings. But that is what I think: many comic book covers would be better off with a hand lettered logo. When I was editor of the Dutch edition of (A Suivre) in the eighties, I got mini-tapes with a few hours of interview that Martijn Daalder had done with Alan Moore. Only a fraction of his talks could be used in the magazine but it was an avalanche of ideas that impressed me very much. He talked about his series ”Big numbers” , a comic book about mathematics that he back then planned to make with Bill Sienkiewicz. Stupidly, I didn’t make a copy of those tapes.